Shiver! 30 Degrees This Morning! Burr. Checked the temperature this morning while I was getting ready to come to work and it was 30 degrees! We have been wanted it to cool down, but now I’m not sure I’m ready for it! Yes, we need it to cool down the lake so it will turn and we can get some oxygen coming through the gates. We continue to see no generation during the morning and early afternoon hours. Generally one or two units come on in the late afternoon for 2-5 hours then off the balance of the night and not back on until late the next afternoon. Jim had a couple of his regulars, Wayne and Coleen, from Hawaii out both Saturday and Monday this past week. He didn’t think they would go our Monday as it was rainy, cold and miserable. They came to fish and fish they did. Good couple days for them on the baby ruby with the blood worm dropper. Caught a few stripping the JQ or tiger tail. Chris went out late morning with Stan for half a day. Fortunately, they caught fish early as the generators came on earlier than projected. Trashed up the water pretty good so Chris was cleaning his flies with every cast. They caught fish on the ruby 2. Thursday, Stan had Jeff and Sheila, from Texas out for half a day. Good day for them on the P&P and Ruby 2 midges. Carolyn was giving Sam, also from Texas, a crash refresher course in casting. Now that Sam had a refresher course, he was ready to go fishing on Friday. His wife Joyce rode along and really enjoyed being on the water and enjoying the outdoors. It was a beautiful day. Very little wind and lots of sunshine with temperatures in the mid to upper 60s. Sam had a good day casting and catching on the Ruby 2. Jim had Frank out for the day. He was catching on the baby ruby or P&P with a blood worm dropper. 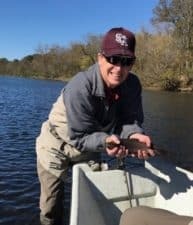 This entry was posted on Sunday, November 13th, 2016 at 1:23 pm	and is filed under Fishing Reports. You can follow any responses to this entry through the RSS 2.0 feed. You can leave a response, or trackback from your own site.